We are overwhelmed by the way you have all embraced An Ordinary Office. The time has come (sooner than we ever dreamed) to expand our offering. We would like to also offer versions in BSL and audio as well as adding a mid day prayer and moving our evening prayer to being an actual night prayer. Currently the day to day work on the project is being done voluntarily by Dave & Chris and funded from their own pockets. To expand the project in the way we envisage will put us under pressure in times of time and finances as some of the services we need will have to be bought in. If you have found this project helpful and would like to see the work progress, please would you consider making a donation, no matter how small, by clicking the button below. Disability and Jesus began with the premise that so far much of what has been written on disability theology has been written from an observational view point, not from someone living within a disabled body, struggling with the day to day of all that that can bring. We grew out of a need to give disabled people licence to tell their stories - frankly, no matter how difficult we may find listening to those stories to be - and a need to be prepared to actually listen, no matter how uncomfortable or challenged we may feel, to withhold judgement until we are fully conversant with these stories. We will never get to grips with the heart of the matter if we are not prepared to get real about one another’s lived experience. We believe it is in the midst of this experience, however painful, that we are most likely to hear the voice of God. At the very point where it’s all getting too much and you want to run away, we are finding that it’s so often the point where Jesus speaks. If we have never gone to the edge of the cliff and looked over, then how do we know it is dangerous. We trust in a God who will not let us fall off but we have learned that sometimes he gives us a glimpse of what is over the edge and asks that we face it, trusting in him to not let us fall. And even if we were to fall, between the edge and the bottom is the mercy of God. Join us as we throw the box of disability theology up in the air and try to see what falls out - and as we sift through the debris to see what is of God: what he would have us discover and what he would have us consign to the theological scrap heap. The truth about the formation of Disability and Jesus is that it was born out of pain, out of grief, out of frustration and even some bitterness. In reality it came from a place of more than a little anger, it was in fact a real cry of the heart. It began with a few of us on Facebook bemoaning the lack of good Christian literature on disability. 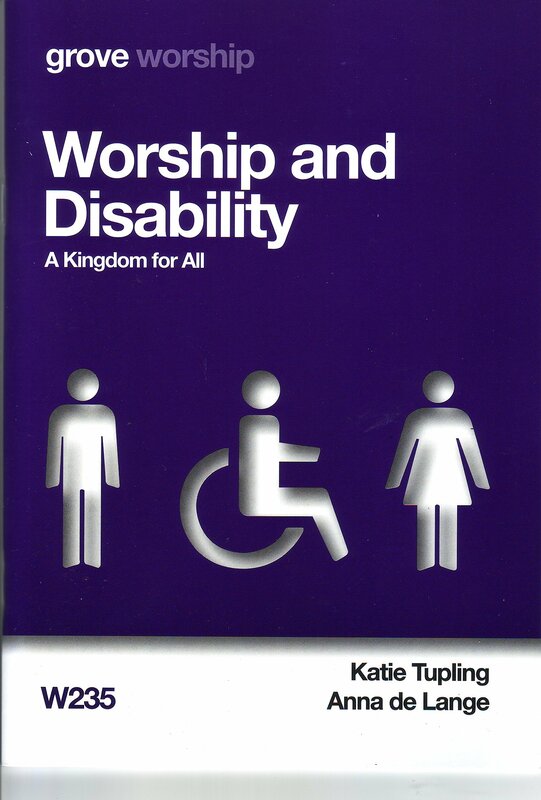 It came from a belief that too much of what constitutes Christian teaching on disability had been written without us, often by the so called experts, professionals working in the field of disability, pastors expanding their own theories, often without any personal experience of disability or very often family members of disabled people seeing the issues from their view point but very rarely from disabled people themselves. The secular world of disability rights has a slogan “nothing about us without us”, we believe in that statement passionately and as time goes by it has become something of a mantra to us, expect to hear it time and again as we move on. Dave will tell you that his perspective on coming to terms with his disability is very different from the version his parents would tell you. Does that mean his parents version is not true? No, of course not it simply means they were walking that journey in their own shoes. There was a constant tension throughout Dave’s childhood as his parents, out of the best possible motivation, wanted to wrap him in cotton wool and keep him safe - while Dave, simply feeling stifled by that cosseting and wanting to break out, kept trying to push the boundaries of what the medical profession were saying he would be capable of doing. Disability and Jesus is an attempt to respond to that cry of the heart, not just from the three of us but from the vast numbers of disabled people who feel there is no fully welcoming place for them in the church; those that feel they first have to become perfect, to be “awesome” before they can enter. We discussed at great length how, much of the material that was out there was very old with out of date terminology, still referring to disabled people as “handicapped”, often written more out of a sense of pity than one of solidarity. Often the material pre-dated modern thinking, such as the social model of disability, and changes in the law brought about by firstly The Disability Discrimination Act in 1995 and then more recently The Equality Act in 2010. So much of the existing material has been sanitised to protect the sensitivities of overly churchy people. The real stories of abuse are cleaned up so as not to offend, the anger, rage and often bitterness experienced by disabled people is played down, firstly so as not to show disabled people in a bad light and secondly so as not to upset the nice churchy people. Most of the other material we have found during our research has attempted to tackle the theology of disability in isolation, not looking at what we have with other groups that might be thought of as being on the margins of church and not looking at the broader context of disability within wider society, issues of isolation, segregation, institutionalisation, abuse, poverty and so much more. All these things must be considered when trying to form a picture of why disabled people may be feeling disconnected from church. Oftentimes we have found the only way to explain our thinking is to temporarily place ourselves outside the church and try to see ourselves as others see us. It is important that you understand that when we do this we may not actually share the views being expressed but it is vital that we, the church, do our best to see how we are being perceived by those outside of the church and that we understand that often such people have just cause - that there are areas where we as church simply need to repent and humbly ask their forgiveness. Some of the things that have been done to disabled people in church settings are simply unjustifiable yet countless times that is what we hear -excuses and justification - when what we need to do is simply hold our hands up, apologise and hope that disabled people have the good grace not just to forgive us but to be prepared to give us another chance. Much of the other literature we found came from the US and was culturally very different to the UK. Much of it was heavily Evangelical in leaning, often based on the belief that for a disabled person to be “saved” they must first be “cured”. (And carrying the implication that not to be “cured” was an indication that one’s faith is somehow lacking). This implication has been more than a little damaging for us in the past, and in the years since the formation of Disability and Jesus we have heard similar stories from so many people. It is a source of great sadness to us and remains a driving force behind the work of Disability and Jesus - in fact it may be said that it has been one of the major misunderstandings that set us on this journey, a pilgrimage to discover what Jesus is saying to us about the difference between healing and cure, something none of us had even begun to explore until that first conversation on Facebook which led to the formation of Disability and Jesus. It is very difficult to talk to you about the kinds of negative attitudes, bad theology and downright abuse that disabled people have suffered, and indeed are often still suffering, in some churches. We are not in the business of naming and shaming but please believe us when we tell you time and again we encounter disabled people whose stories of their church experiences are simply horrific - and often this is happening in the most high profile of church situations. We mentioned that first conversation on Facebook. It began as a simple question, with a couple of responses - but over the course of a few evenings the thread grew and was expanded on, there was lots of talk about writing a book and with that in mind we decided that since all the people involved in this conversation just happened to be scattered across the north of England, we could arrange to meet up. We agreed that we would get together in a pub on the outskirts of Harrogate, a kind of central point for all of us, and we would have a chat over some lunch, throw some ideas in the pot to see what might be done. The only real qualifications any of us had for this task were our own lived experiences as disabled people living within and even sometimes outside the church. 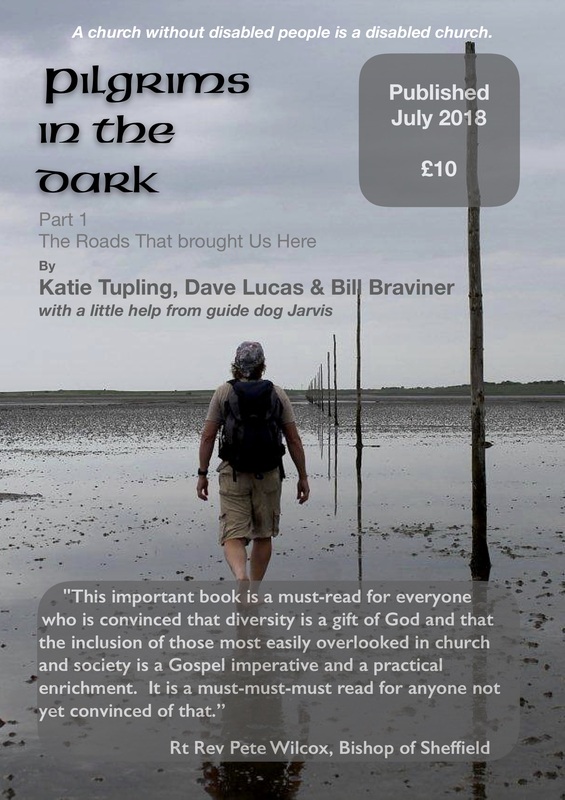 Bill and Dave had been working for a few years on a project they called “Lighting the Landscape”a project based largely round the visually-impaired and guide dog community. They had written about the etiquette of visual impairment and taught on low vision awareness, as well as organising services and events for the visually-impaired community in the north east of England and beyond - including not just visually-impaired people and guide dog owners, but also guide dog staff, puppy walkers and volunteers. It was in this work that the seeds of our ideas on interdependence first began to take root. From the work Bill and Dave had already been doing, they produced a little booklet of some of their ideas - “Towards an Accessible Church” - just to get the conversation started. Before we’d even finished our first round of drinks or even before our food arrived, it had already become clear that what we needed was way more than a book - that would come later (indeed it has taken us until now, almost some three years later, to get to the book). Instead, we realised that we were being told there was something far more urgent than a book. It was made clear to us that what we needed was a task-force of disabled people, people who could go out in to the wider church and share their stories, who could show that Jesus’ love for disabled people is not so much revealed in the cold dryness of academic tomes on disability but rather in the telling of individual stories by disabled people themselves, - stories that connect straight with the heart of the listener in a fundamental way that no academic work ever could; stories that engage not only the head but go straight to the heart. To have written a book at that point would have been to try and write the story before we knew what the story was about. The journey we have been on over the last three years would seem to bear testimony to that theory. No access audit, no explanation of disability theology, no criticism of how a church is performing on issues of disability seems to reach people as effectively as us simply sitting down and telling our stories. Countless times we have turned up to speak at an event having carefully prepared what we thought we should say and within a few minutes of being with those gathered there we begin to realise that what they really need to hear are examples from our own journeys and as that becomes clear notes get torn up and discarded and we simply sit with these people and tell our stories. As the stories are told there is a tangible feeling of hearts being opened, time and again we have been amazed at how this takes place. Such is the relationship that God has forged between the three of us that we feel safe enough to share some of the deepest, most painful and hopefully most profound parts of our story knowing that the rest of the team has our back and fully supports us. This is embodied in a great sense between the three of us that we should follow the ancient Cistercian tradition, and write / speak not as individuals but as a community. It’s interesting to note that since we opened ourselves to that decision we have not undertaken any project by soliciting for the work but rather the work has come to us either through recommendation or people seeking us out through the internet via our website or through our presence on social media, through Facebook and Twitter. We have learned that the web in all its guises is a great way of reaching those on the margins, and we will talk more of that later. We all returned home from that initial meeting with a bunch of very unstructured ideas and lots more questions than we had started out with, some of which were very thorny and would become an obstacle for some. Such were the birth pangs of Disability and Jesus, from difficult beginnings and out of the pain the three of us have suffered, has grown an organisation which has brought healing and meaning to our lives and hopefully the lives of others too, a new sense of the place of disabled people right at the heart of church and it has introduced us to a whole new world we had not been aware of, opening the door to a network of disabled people and their supporters struggling to define a theology of disability, this network stretches right across the globe yet remains largely undiscovered by the wider church. In matters of faith and exclusion, disability still feels like the poor relation. Church seems to have a tendency to veer more towards matters of sexuality and gender, and these seem to be all that many associate with matters of inclusion. This is something of an indictment on the church. We find ourselves now, almost four years on, as part of this widening network of communities on the edge of church a place which Bill loves to call “church on the margins”. This wide ranging group of communities that are experiencing a wave of the Holy Spirit bringing, healing, meaning and understanding not just to ourselves but delivering it back to the wider church, not just being ministered to but in return ministering to the broader church. These ‘marginal’ communities are not just of disabled people but are made up of many who feel themselves to be on the edges of church - the poor, the homeless, the LGBT community, refugees, the travelling community and others. In these days when there is so much talk in the west of declining church numbers, we are beginning to see that it is within such communities that the Holy Spirit is working. It is these communities that are on the rise, breaking new ground, exploring new theologies. We see these groups as having the power, drive, openness and creativity to revive the broader church, if only the church will let them in. These are groups of people who are hungry for meaning, for welcome, and for inclusion. They are hungry in a way that the stereotypical ‘WASP’ has no felt need to be. This is something which leads us to wonder whether there is a prophetic call from God for us to reach our to these ‘fields which are ripe for harvest’. What is evident is that God is working within these communities, and if the church does not let them in we should not be surprised when it seems as if God has moved out of our churches to be with them. We have a God whose story is of seeming to be at home with those on the margins, after all. We find it sad that the church spends so much time trying to restock the pews when there is such an obvious movement of the Holy Spirit on the margins. Just as Jesus did, if we gravitate to the margins then church growth will begin from the outside in. So far our journey has taken us to national conferences, to General Synod, to advising Songs of Praise for the BBC, to appearing in packages for Channel 4 News, to speak at and take part in the Living Fully 2016 conference in the Vatican, and many other events. It’s a journey that shows no signs of slowing. We thank God for the journey he has set us on, a journey that not that long ago we didn’t think was possible - and we look forward to what is to come. Four years ago, we had not met so many disabled people struggling to find acceptance within the church. Yes, we assumed they were there - but we had not yet met them. Four years ago, we had no knowledge of the many other groups and individuals already working in this field. God has given us the gift of the last four years to meet fellow pilgrims on this journey, to hear their stories, to share their joys and their pains, to study, to pray, to build relationships. We hope this website blesses you in some way.